Add an elegant and natural hint to your yard by coiling your hose around this Whitehall Filigree Hose Holder. 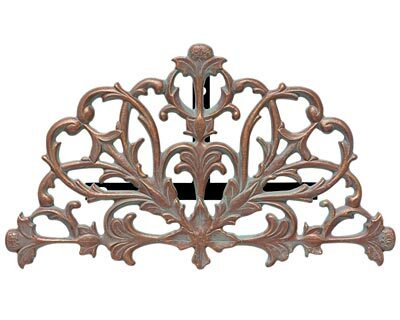 Interlocking leaf and flower bud shapes create the intricate plate of this holder, seeming to emanate from the bottom leaf figure for a bold item. Verdigris accents throughout the depressed sections of the unit add an aged look to the piece, while the copper color on the rest of it offers contrast. Connect this holder to your wall using its three support tubes and back plate, to easily accommodate up to 100' of standard garden hose (not included). The aluminum construction forms a durable and beautiful holder, and its weather resistant finish is sure to remain vibrant. Bring bold and lasting style to your yard and keep your garden hose tidy with this Filigree Hose Holder. Made in the USA.